The most difficult part of completing a costume is the footwear. These choices should do excellent service for just about all periods. They're well-made boots that are cut from the best glove tanned leathers and have an all-suede finish. They're very warm and comfortable. Inside is a 1/8" thick, cushioned insole. What's even better is that they have a hard sole, so you can wear them all day long at fairs and festivals. With a little judicious decorating, they can range from Viking to Scythian, from the Franks to the Renaissance. Men's sizes 7-13 (whole sizes only). Available in Brown or Black. 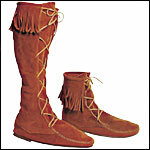 Available in High or Low boot versions and with or without leather fringe. Low Suede Viking Ankle Boots are comfortable and versatile. Soft suede uppers with a rubber sole, available in men's whole sizes. These tall Medieval boots are the perfect compliment to a Robin Hood outfit. These suede, calf-high boots are warm and comfortable. The lace-up front allows for a custom fit. Made from the best glove-tanned leather with an all-suede finish. Inside is a 1/8" thick, cushioned insole. Rubber out sole, so you can wear them all day long. These well-made boots are cut from the best glove-tanned leathers and have an all-suede finish. Inside is a 1/8" thick, cushioned insole. They have a rubber out sole, so you can wear them all day long in comfort. Perfect for rendezvous, frontier outfits, or just plain comfort. These well-made low boots are cut from the best glove-tanned leather and have an all-suede finish. Perfect for rendezvous, frontier outfits, or just plain comfort. These well-made low boots are cut from the best glove-tanned leathers and have an all-suede finish. Inside is a 1/8 inch thick, cushioned insole. They have a rubber out sole, so you can wear them all day comfortably. Men's whole sizes 7-13.